the curious g :: art > culture > travel > and other curiosities » Pasta – mai basta! The [other] good thing about donating books is that it makes room for the books that have been packed away. This was the case for me after saying goodbye to 20 books (now part of the book swap at my local library). I have revisited 10 cherished titles. 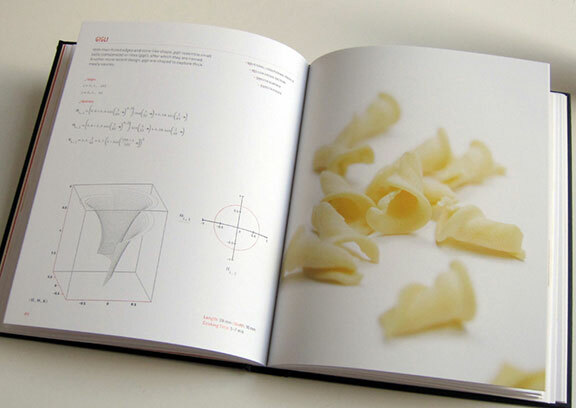 Among the group are two gorgeously-designed books: The Geometry of Pasta and Pasta by Design. While different in purpose, the books share analyses of pasta shapes, although in different ways. 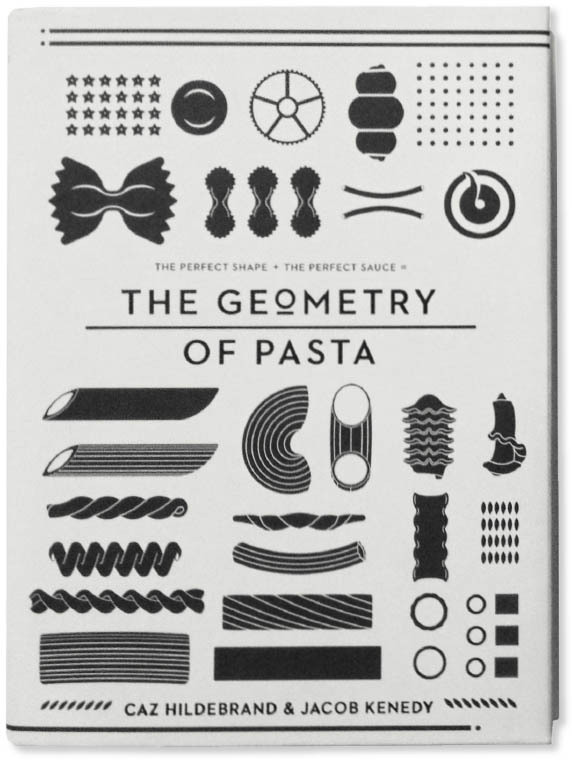 The Geometry of Pasta by Caz Hildebrand and Jacob Kenedy is deceptively simple-looking cookbook. Designed without large color pictures (or any color at all), those standard cookbook visuals are replaced by beautiful black-and-white graphic representations of the various pastas. Seemingly untastey, right? Yet the book is aimed directly at one’s senses, and perfectly pairs flavor and form. Filled with over 100 authentic recipes, the book is sprinkled with Italy’s regional history, the diverse pasta shapes that each region developed, and why specific sauces/flavors match the tubes, shells, bow ties, ears, wheels, pockets and other beautiful shapes and textures of pasta. It’s a poetic journey through pasta history. Click here for a taste of the animated contents. 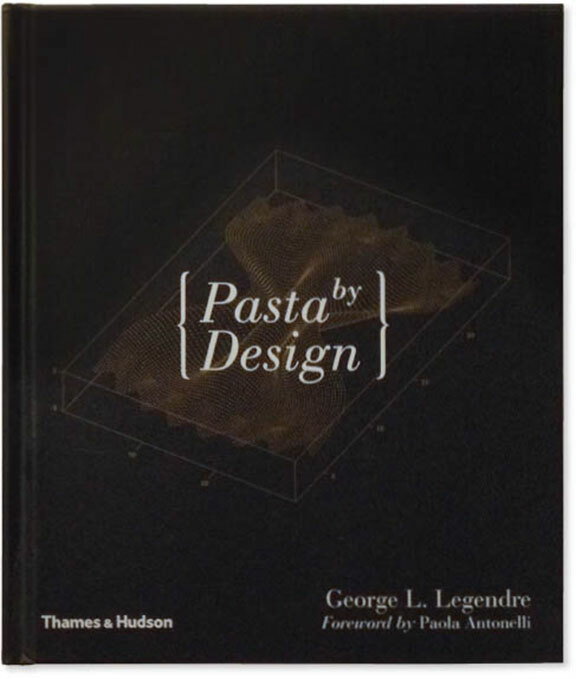 Poetic in a very different way, Pasta by Design by London architect George L. Legendre, analyzed the shapes of pastas and created intricate formulas for more than 90 types. Beautiful, minimalist images of pastas are juxtaposed with mathematical equations, graphs and renderings of each shape. No recipes here. Instead there’s pasta engineering. Helices, parabolas, circles and arcs plot the graceful curves and precise textures that perfectly hold the sauces, accompanied a brief anecdote on the pasta’s geographical origin and appropriate sauce partner. The book reveals the hidden complexity in simple pleasures. This entry was posted Thursday, July 3rd, 2014 at 7:11 am	and is filed under art, just curious. You can leave a response, or trackback from your own site.